Raindrops drum on the Cessna’s aluminum floats, adding an urgent rhythm to our mission as one by one we ease ourselves out of the plane and into the shallows. Clad in waterproof jackets and rubber boots we splash to shore, but reaching land doesn’t improve anything as far as the rain goes; there is no shelter as we stand on a gravel bar beneath a lowering sky. Nobody is complaining, because our attention has been caught by something more compelling than the weather: Someone has spotted a bear. “Oh my God!” exclaims a young woman in our group, as the rest of us squint and strain to make sense of a blurry shape far ahead of us. 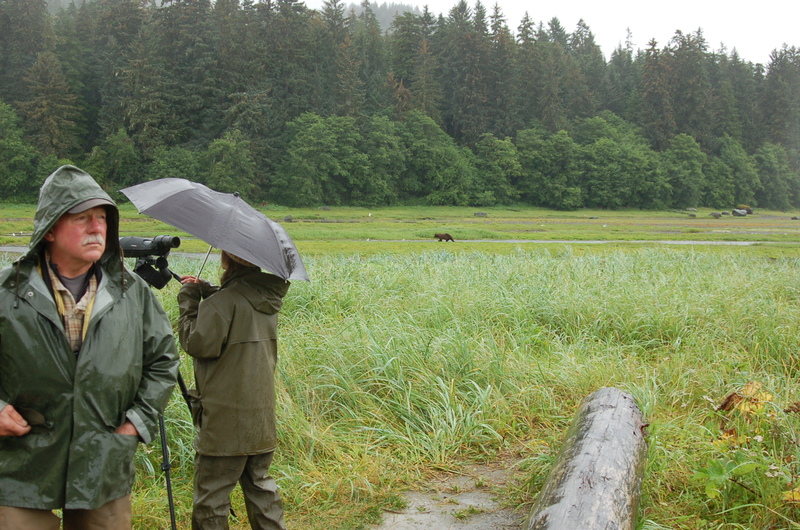 I fumble for my binoculars, scanning the mud flat at Pack Creek. 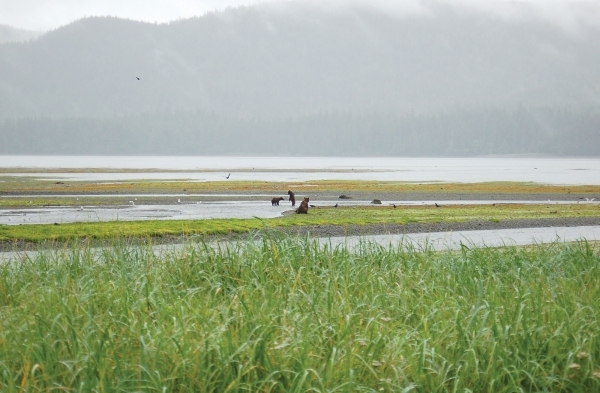 And there it is: A brown bear walking along the stream’s rocky banks. The animal moves in a way that seems almost casual. Then suddenly, swiftly, it plunges its paw into the creek; water flies in all directions as the bear pulls out a wriggling pink salmon. How long does Hughes, a New Orleans native, plan to live among these gold rush artifacts, in the restored ruins of a turn-of-the-century mining camp? This article appeared in the November 25 issue of The Juneau Empire. 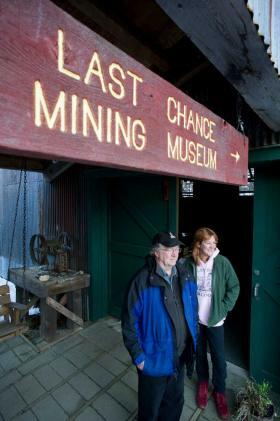 Photo by Michael Penn/Juneau Empire Gary Gillette and Renee Hughes at the Last Chance Mining Museum where they have lived for twenty years. On those Juneau mornings when the snow falls with a denser-than-usual determination, slipping out of the seductive comfort of our sheets and stepping onto a cold floor, into a frosty day, can be a daunting proposition. For Renee Hughes, the task is especially tough; while many of us dread the short walk from our house to the driveway, she gamely straps on her snowshoes, flicks on her headlamp and braves a 60-minute trek to reach her car. Hughes says that, luckily, some of the work she does for the school district she can do at home. And when home is an apartment above the Last Chance Mining Museum, situated in the Last Chance Basin at the end of Basin Road, “working remotely” doesn’t just involve a flexible employment schedule; it often entails a geographic reality. To reach downtown Juneau, Hughes and her husband, Port Engineer Gary Gillette, must hike down Basin Road and across the Basin Road Trestle Bridge. But during winter storms, they are often snowed in. And even when and if the road is clear this winter, Hughes still won’t be able to drive directly into town: The Basin Road Trestle, which was built in 1936, is undergoing a rehabilitation that began in October and won’t be finished until spring. In the meantime, no cars are allowed on the bridge. 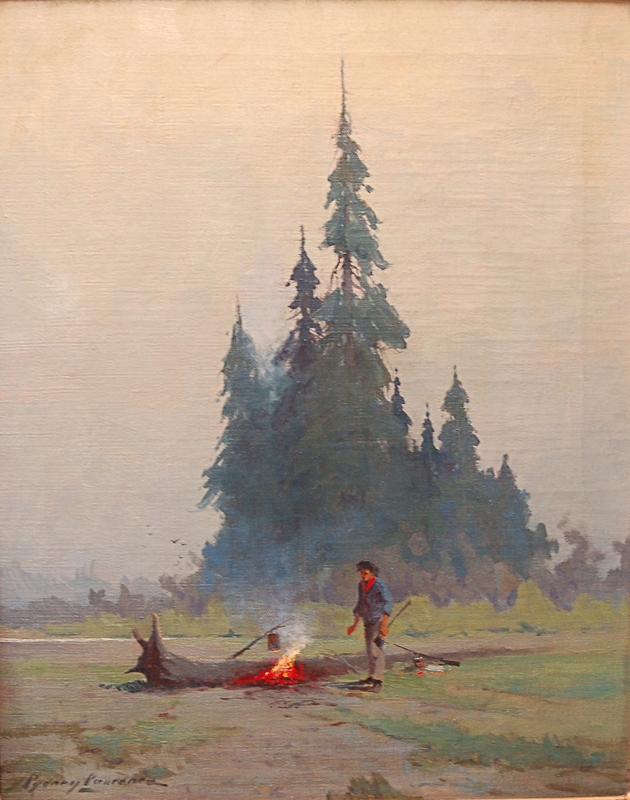 This isn’t the first time Hughes and Gillette have had to navigate a difficult journey home —when she first moved out to the museum about 20 years ago, they had to cross Gold Creek by boat. 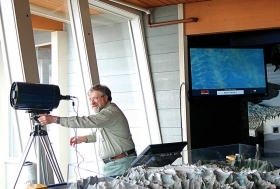 Photo by Amy Condra, Mendenhall Glacier Visitor Center Director Ron Marvin adjusts a telescope that will transmit images of wildlife, such as far away mountain goats, to a 55-inch screen mounted in the visitor center. Across the lake from the Mendenhall Glacier Visitor Center, a mountain goat forges a slow and steady path up a cliff that rises far above the center’s standard vantage point. This summer, it’s possible — telescopes will track these and other animals, and transmit their images, in real-time, to a 55-inch screen. 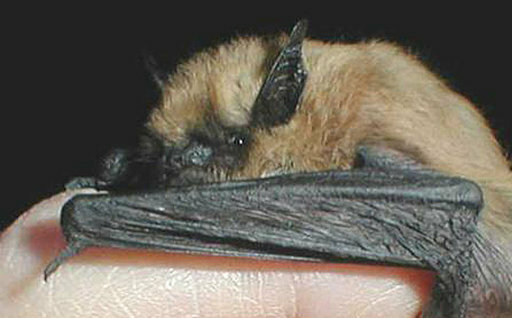 Courtesy of the National Park Service, California Myotis is one of the five species of bats found in Alaska. Fruits and flowers ripen into lush, succulent shades, bodies of water, gleaming and still, trees swaying rhythmically across a sultry twilight — such images are the stuff of holiday brochures and postcards. These scenes also depict an environment in which most of the world’s 1,000 species of bats live and thrive, where they have everything they need: seeds, insects and a variety of places to roost. Although 70 percent of bat species choose to live in tropical climates, there are five species that call Southeast home: Keen’s long-eared bat, long-legged myotis, California bat, the silver-haired bat and the little brown bat. The most common of these is the little brown bat, Myotis lucifugus, which is the only bat species that not only resides here, but also ventures up to Southcentral and Interior Alaska. The little brown bat is about nine centimeters long, with fur ranging from cinnamon to dark brown and ears that, when laid forward, nearly reach the tip of the creature’s nose. 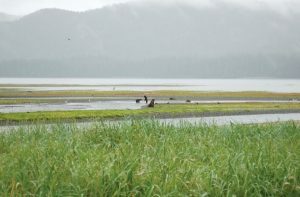 Blejwas, who works with the Wildlife Diversity Program at the Alaska Department of Fish and Game, will be presenting “Bats in the Backyard: Flyers in the Forest” this Friday as part of the Mendenhall Glacier Visitor Center’s Fireside Lecture Series. Photo courtesy of Edgeware Productions, Elizabeth Ware in the title role of "Libby"
In 1879 Libby Beaman boarded the S.S. St. Paul to venture across the Bering Sea toward the Pribilof Islands. The ship’s captain told the Washington, D.C. socialite that she would be the first non-Native woman to venture to the remote Pribilofs, where her husband would serve as Assistant to the Senior Revenue Agent. This week in Juneau, Libby Beaman, as portrayed by actress Elizabeth Ware, will tell audiences what it was like to live in a land that could be both hostile and hauntingly beautiful. “Libby,” a one-woman play based on Beaman’s diary and sketchbook, has been performed throughout Alaska and the Lower 48, and has earned a four-star review at the Edinburgh Fringe Festival in Scotland. This week’s performances at the Juneau Arts & Humanities Council will mark the first time the play has been staged locally. The Anchorage-based actress has assumed the role of Libby numerous times over the past 13 years. On St. Paul Island, Libby met the Pribilof Aleuts, who had been brought to the Pribilofs a hundred years earlier by seal fur traders and had, under first Russian and later American rule, endured tumultuous upheavals. They had also developed a unique culture, one that couldn’t help but influence Libby’s impressions of life on the island. 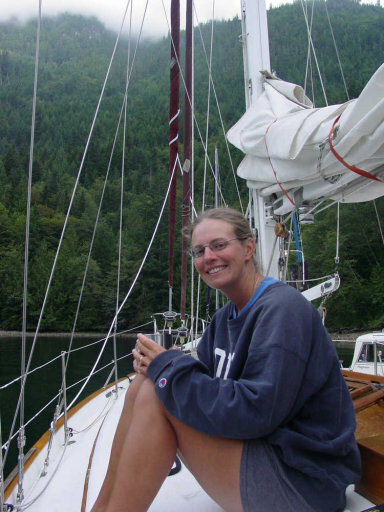 “She was drawn into the life and people there, into their community and values,” Ware said. The director of the play, David Edgecombe, holds a Ph.D. in theater history and directing from Kent State University and is a professor at the University of Alaska Anchorage’s Department of Theatre and Dance. Ware says that she and Edgecombe first learned of Libby’s story in 1992, when they were working with a theater company in Vladivostok, Russia. “My mother was planning to come over and asked us what we wanted, and we said, ‘Peanut butter and books in English, please!’” Ware said. One of the books her mother brought was “Libby: The Alaskan Diaries and Letters of Libby Beaman, 1879-1880,” published in 1987 by Libby’s granddaughter, Betty John. 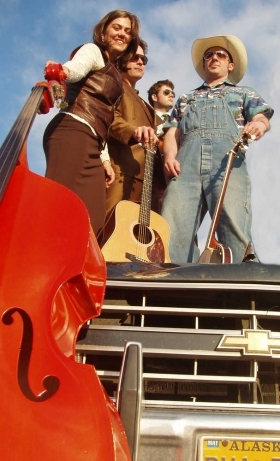 “The story was fascinating, and I had a sense of it as a one-woman show,” Edgecombe said. He started adapting the book for the stage in 1997, in response to a request for a play that would commemorate Women’s History Month by celebrating Alaska’s pioneering women. 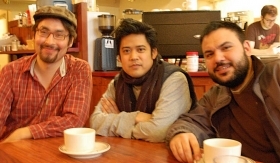 “Libby” was first performed at Cyrano’s Off-Center Playhouse in Anchorage. But it is a performance on St. Paul Island, where Libby wrote her journals and drew in her sketchbook, which offered Edgecombe a rare insight into the play’s setting. “Liz performed in a community center, and in the distance you could hear barking seals, right when she was talking about the seals!” Edgecombe recalled. The play’s Juneau performances are being sponsored by the Friends of the Alaska State Museum, and the organization’s vice president, Renee Hughes, said a museum exhibit prompted her desire to bring “Libby” to town.